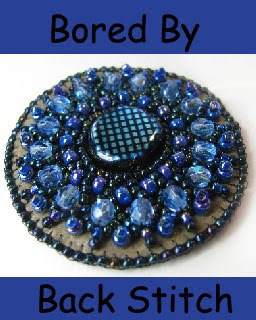 Beading Arts: Bored By Back Stitch e-book has been relaunched! Bored By Back Stitch e-book has been relaunched! Bored By Back Stitch begins with twelve different motifs, stitched from what are usually regarded as beadweaving stitches rather than embroidery stitches. From there we move into combining these stitches into ever-increasingly complex patterns, and we end with wonderful new materials that add surface interest to your bead embroidered pieces. More information on this 298 page e-book can be found at the link above. Information on all of my e-books is located at this link.